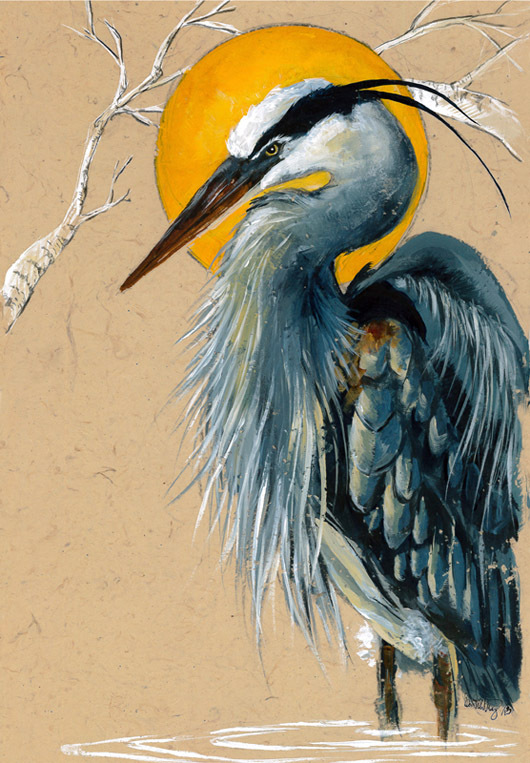 Danielle Mulcahy doesn't let an injured wing stop her, she just paints with the other hand. 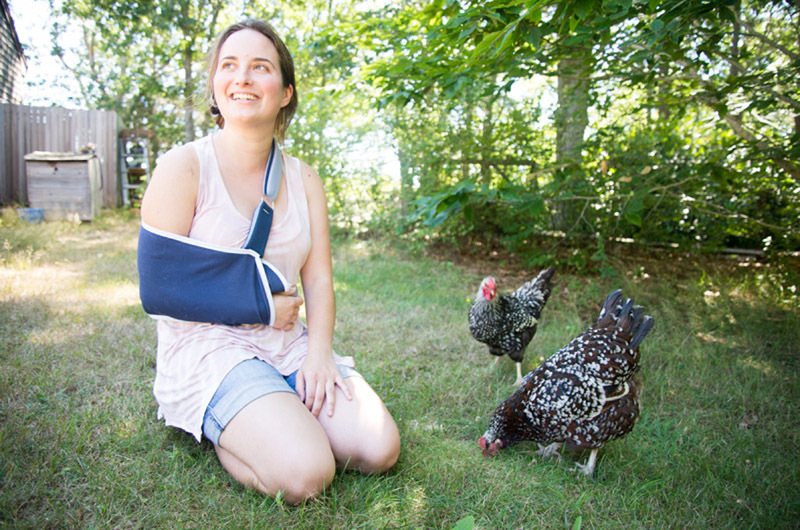 Danielle Mulcahy sees something holy in chickens. She is delighted by their peculiar shape and their particular attitude. What started as a warm-up exercise in college has turned into a series of paintings. Her collection of animal paintings all have Renaissance-style halos under the aptly named title, BarnYard Saints. 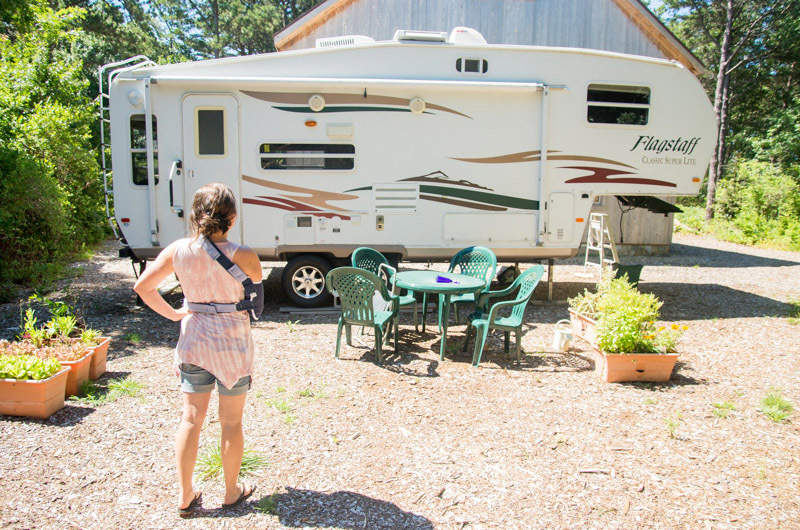 This fall, Ms. Mulcahy is taking her saints on the road for a continental United States tour of artisans festivals in a newly purchased camper-turned-art-wagon. The 26-year-old artist grew up in Holden, Mass., where she struggled to keep up with other students academically. She was diagnosed with attention deficit disorder and dyslexia. Art and athletics were her solace from the difficulties of academia. She remembered being asked by teachers to stay after school for extra homework. Her mother said no, protecting the time her daughter could devote to her art. Arriving at art school was a huge change. Suddenly, she was ahead of the class. It was in her first drawing class at Mass Art that she met Walker Roman. At first he was her rival in the class, then her bridge to the Vineyard and now her fiance. Mr. Roman grew up on the Vineyard and the couple moved into his parents basement, turning one room into a studio. Ms. Mulcahy works in the studio at night, but prefers natural light and retreats upstairs to the large windows to turn fleece into skein scarves and paint. She is also an illustrator, painter, a fiber artist, a mask maker, photographer and filmmaker. She works freelance and sells prints, paintings, yarn and skein scarves at the Chilmark Flea Market and the Artisans Festival. This summer she has a special addition of left-handed chicken drawings. After surgery to repair her right shoulder from multiple dislocations (Danielle is also a martial artist, dancer, ice hockey player and handstand queen) she thought she might take a break. 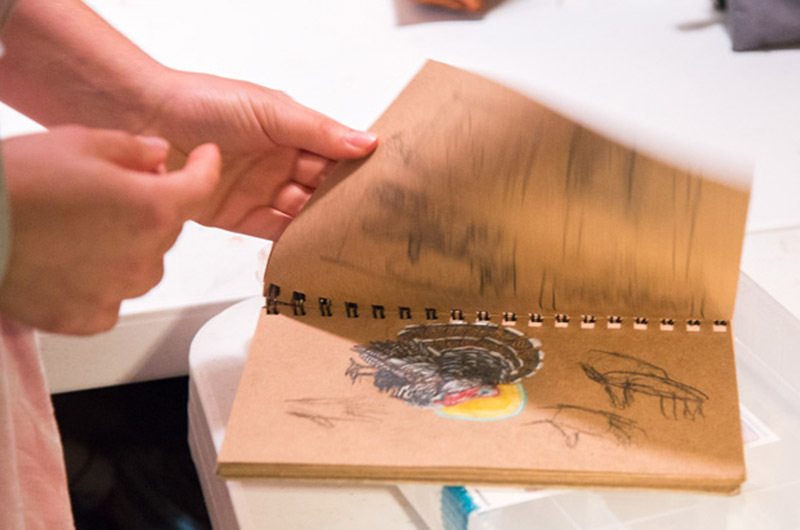 But the creative spirit decided otherwise, and she began drawing chickens with her non-dominate hand. And people wanted those chickens. She uses her two chickens, Sadie and Dolly, as models, as well as clipped photos from magazines. A cover of Country Life featuring a chicken with beautiful tail plumage hangs on her studio wall near an illustration of Nancy Luce, the Island’s first chicken lady. “Nancy Luce, she’s my lady,” Ms. Mulcahy said. 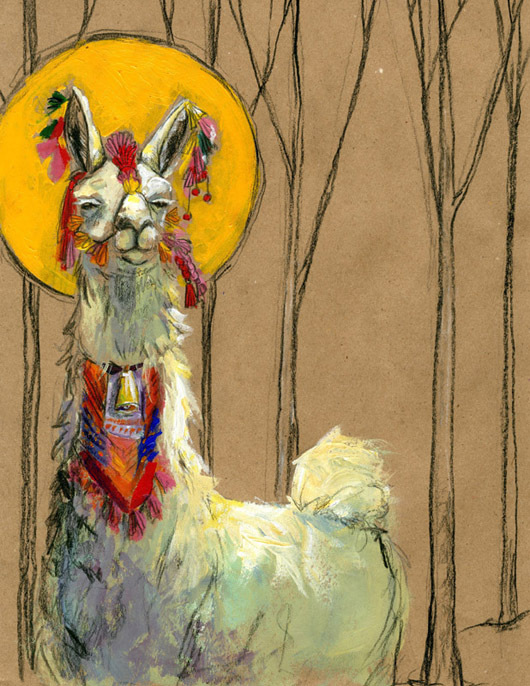 Though it began with chickens, the “sassy llama” is the best seller from the BarnYard Saints collection, she said. Other saints are goats, owls, roosters, sheep and cows. She worked on farms in college and feels connected to animals and the land. Ms. Mulcahy hopes to turn BarnYard Saints into a community with more artists contributing, perhaps with a permanent location on a sustainable farm. Right now she showcases her work with Mr. Roman’s abstracted landscapes. Sassy llama is best-seller from BarnYard Saints collection. Last summer, while working the festival and the flea market, people kept telling them how well BarnYard Saints would do in other cities like Boulder, Co. Ms. Mulcahy had always wanted to travel and convinced Mr. Roman to go on tour with her. In their trailer, which Ms. Mulcahy thinks currently looks like a big tissue box, there will be a studio space for on-the-road creating. Though the small space restricts which creations she can complete (there will be no mask making on the road) she plans to bring a few masks along to photograph or film across the country. Ms. Mulcahy and Mr. Roman have a road map that follows the foliage through the Northeast and turns South to chase the warmer weather, swings through Louisiana toward Austin, Tex. in the spring and then on to California. From there, she doesn’t quite know. I have dyslexia too, and a aphasia. In my day they didn't even have the word dyslexia a teacher and principal of my school told me I would make a good dich digger. Went to Vietnam and use the GI Bill to learn how to read a little I had my own business thanks to people that believed in me and work for the Post Office as mail handler now I'm retired. Things to work out just a little bit differently 4 people that have learning disabilities. Keep the faith in yourself and you'll do fine.